Ifrit is an action shooter for the PC. 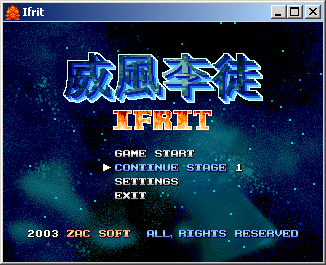 Ifrit is a freeware shmup game by ZAC GAME STATION, the creators of Guardian of Paradise. It’s a horizontal shmup with gameplay somewhat similar to Gradius’s. Ifrit can be downloaded here. NDT’s translation patch translates the entirety of the game’s text (mostly menus) into English.